Transitions during spermatogenesis from mitotic divisions are accompanied by dynamic transitions in the expression of different networks of cell cycle genes, and they suggest that at least some of this differential gene expression may play key roles in regulating the progression of spermatogenic cells through the process of spermatogenesis . Decreased expression of proliferating nuclear cell antigen (PCNA), which is a marker of DNA synthesis, especially in spermatogonia, has been reported in testes of men with varicocele [75, 90, 91]. Heat stress is reported to induce double-strand breaks in the DNA due to denaturation and dysfunction of heat-labile repair proteins such as DNA polymerases. Testicular DNA polymerases a, b, and g were also decreased and the activities of DNA polymerase b and g were related to the deleterious effect of heat stress in a cryptorchid model  and tissue cultures . Rather than germ cell apoptosis, impairment of germ cell proliferation would be more crucial in the pathophysiology of spermatogenic disorders in men. A typical cell cycle progresses through mitosis (M phase) alternating with a longer interphase, which is divided into three phases: G1, S, and G2 . A cell grows during the Gj phase, continues to grow and duplicates its chromosomes during the S phase, prepares for mitosis during the G2 phase, and divides during the M phase. Spermatogonia are mitotic cells that can be expected to share mechanisms of cell cycle regulation with other mitotic cells, including most somatic cell types. During meiosis in primary spermatocytes, the DNA is replicated as in a mitotic cell cycle, but homologous chromosomes pair and chiasmata form between the homologues to facilitate genetic recombination and the subsequent proper segregation of chromosomal homologues to each secondary spermatocyte. This is followed by a second meiotic division without an intervening round of DNA replication that separates sister chromatids into haploid spermatids . Because meiosis occurs uniquely in germ cells, spermatocytes can be expected to utilize at least some cell cycle control mechanisms that are not used in mitotic somatic cells or in premeiotic spermatogonia. M-phase promoting factor (MPF) is a key enzyme required for the G2/M-phase transition in both mitosis and meiosis. MPF is composed of a regulatory subunit, cyclin B, and a catalytic subunit, Cdc2. Activated MPF phosphorylates cellular machinery components involved in nuclear envelope breakdown, chromosome condensation, spindle assembly, and cyclin degradation, thus controlling both mitosis and meiosis. Basically, Cdc2 expression remains relatively constant, while the cyclin B concentration fluctuates periodically throughout the cell cycle. Although the mRNA expression of cdc2 did not differ between spermatocytes of testes from heat-shocked mice and those from control animals , Cdc2 protein is fragile and susceptible to heat. Transient heat stress was reported to induce a swift decline in the Cdc2 protein level before the germ cell apop-tosis was detected by the TUNEL assay . Cyclin B accumulates during the interphase and peaks at the G2/M-phase transition. The association of Cdc2 with newly synthesized cyclin B initiates a series of alterations in the phosphorylation status of Cdc2, which is required for the activation of MPF. Activated MPF triggers the entry of the cell into the M phase, and cyclin B is degraded. This degradation leads to Cdc2 kinase inactivation, finally causing the cell to exit M phase  (Fig. 8.5). Fig. 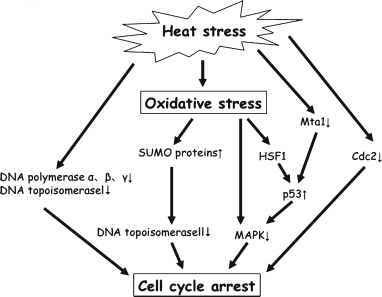 8.5 Pathways to cell cycle arrest resulting from heat-induced oxidative stress in germ cells. These pathways are mainly reported in spermatogonia and primary spermatocytes. The upward arrow indicates increased expression and/or activity of the molecule. The downward arrow indicates decreased expression and/or activity of the molecule. Pathways indicated using arrows are proven in germ cells. If no association with oxidative stress (e.g., Cdc, DNA polymerases) is shown, their function and expression are regulated by oxidative stress in other cells and Cdc2-cyclin B1 assembly . Decrease in the HSP70-2-mediated CDC kinase activity, which occurs due to heat stress, has also been demonstrated in Se-induced oxidative stress. Involvement of p53 in germ cell apoptosis has already been described . The presence of p53 mRNA and protein in primary spermatocytes  suggests that p53 plays a role in the meiotic prophase. The induced expression of p53 might be due to its increased stabilization and half-life, as suggested earlier, in response to DNA damage and oxidative stress . This increased expression explains the possibility of apoptosis as well as cell cycle arrest at the G2/M-phase checkpoint following oxidative stress-mediated DNA damage (Fig. 8.5). 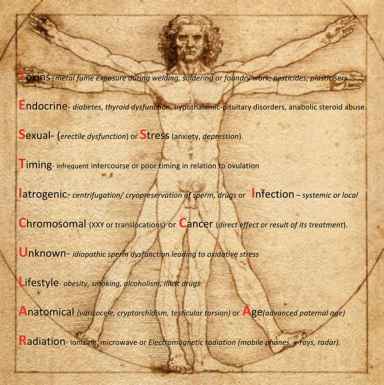 The testis has high rates of metabolism and cell proliferation; therefore, oxidative stress can be especially damaging. Thus, the antioxidant capacity of testicular tissue is very important. Generally, cells become equipped with heat-tolerance machinery after nonlethal heat stress and are able to survive against subsequent heat stresses. This phenomenon is termed thermotolerance . If the second heat attack is substituted with oxidative stress, the cells are capable of surviving even after the second attack, indicating that the initial heat stress induces a range of mechanisms to protect cells against stress. A similar phenomenon has been reported in the case of ischemia/reperfusion injury of the testis. In this case, oxidative stress plays a major role to induce ischemic preconditioning, which protects the cells from the second ischemic attack  , The mechanisms of ischemic preconditioning and induced thermotolerance after heat stress may be common because oxidative stress also plays a major role in ischemia/reperfusion. However, the detailed molecular mechanisms involved in acquiring this thermotolerance machinery after heat stress have not been fully investigated. Furthermore, elevation of scrotal temperature with no increase in the oxidative stress in fertile men with varicocele indicates disturbances in the oxidative stress scavenging system in infertile men with varicocele . The testis contains several antioxidants that serve to protect germ cells from oxi-dative damage. 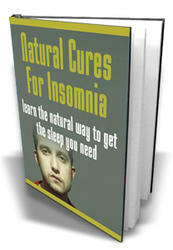 There are two types of mechanisms by which germ cells are protected from oxidative stress: enzymatic and nonenzymatic. The primary antioxidant enzymes in mammals are superoxide dismutase (SOD), glutathione peroxidase (GPX), glutathione S-transferase (GST), and heme oxygenase 1 (HMOX1) [106, 107]. The heme oxygenase system plays an important role in protecting cells from the deleterious effects of oxidative stress and consists of the heme oxygenase pro-teins-inducible HMOX1 and constitutive HMOX2 . There is a distinct possibility that SOD plays a role in the male reproductive system [109, 110]. Germ cells appeared to be highly susceptible to ROS and died without expressing SOD . Furthermore, polymorphism in GST T1 and M1 predicts the response to varicocelec-tomy, indicating the importance of antioxidants in the process of human spermato-genesis . Proteomic studies have demonstrated that heat stress generally decreases gene expression. Taken together, the results of the four studies, which employed a proteomics approach, indicate gene alterations in the testes after heat stress [6, 88, 113, 114]. Further, two studies have demonstrated alterations in gene expressions in testes after oxidative stress [6, 88]. Upregulated genes include heme oxygenase 1 (accession no. : AA213167), oxidative stress-induced protein (accession no. : U40930), and GST P1 (accession no. : P19157). Downregulated genes include extracellular SOD Cu-Zn (SOD3) (accession no. : U38261), GSR 1 (accession no. : X76341), GST a2 (accession no. : J03958), GST Pi1 (accession no. : D30687), microsomal GST 12 (accession no. : J03752), and thioredoxin-like protein 2 (accession no. : Q9CQM9). Generally, these proteins reduce oxidative stress. The expression of antioxidants is observed in somatic cells and, sometimes, in spermatogonia . Germ cells, in general, did not appear to use the antioxidant enzymatic system as the major equipment to reduce ROS damage and, consequently, were considerably more susceptible to oxidative stress than somatic cells . In other words, germ cells except for spermatogonia were not equipped to induce thermotolerance. On the other hand, spermatogonia constitute a heterogeneous population containing type A, intermediate, and type B spermatogonia, and spermatogonial stem cells , Taken together, since the number or biological activity of spermatogonial stem cells can be effectively obtained by heat stress , spermatogonia are considered to be heat-resistant cells. Although the constitutive expression of antioxidants is present, higher antioxidant expression is usually inducible. Generally, effective antioxidant expression in the testes has been shown after 6 h of heat stress , which is apparently longer than the period of induction of germ cell apoptosis. The heme oxygenase (HO) system is recognized as a member of the small HSP family and comprises two HO isozymes . These two isozymes are distinct gene products; the HO-1 isozyme is known as HSP32, as it is heat and stress-inducible, whereas the HO-2 isozyme is the constitutively expressed cognate gene. In the testis, HO-2 is expressed in maturing germ cells, spermatocytes, round spermatids, occasionally in Leydig cells, as well as in the residual bodies . HO-1 mRNA is present in the nucleus of the germ cell progenitor and in Sertoli and Leydig cells under both normal and stress conditions; the protein is present only in nonspermatogenic cell types. The intensity of HO-1 immunostaining induced by oxidative stress is markedly increased in Sertoli and Leydig cells in rats  and humans . The robust expression of HO-1 in Leydig cells following heat stress suggests its role in maintaining steroidogenesis by generating antioxidants. Although these antioxidants are expressed in interstitial tissue or Sertoli cells, gaseous molecules such as ROS are homogenously distributed within the testis, and the antioxidants, irrespective of their localization, may exert protective effects on germ cells from oxidative stress. Nonenzymatic antioxidant molecules include a-tocopherol (vitamin E), b-carotene (vitamin A), ascorbate (vitamin C), glutathione, estrogens, creatine (related to carotene); flavonoids (aromatic oxygen heterocyclic compounds widely distributed in higher plants), resveratrol (a botanical antioxidant), metallothionein (cadmium-binding protein involved in heavy metal detoxification), taurine (an aminosulfonic acid) and its precursors, and other thiols such as nonstructural polyunsaturated lipids and melatonin. Oral administration of vitamin E reduced the level of testicular-free radicals in a rat experimental model of varicocele , and the effectiveness of anti-oxidants to treat infertile men has been previously demonstrated in randomized trials . Therefore, antioxidants can be effectively applied to treat heat-inducible oxidative stress in humans. Ghrelin, an endogenous ligand for the growth hormone (GH) secretagogue receptor, has been primarily linked to the central neuroendocrine regulation of GH secretion and food intake. Further, its actions on reproductive organs have also been reported, for example, steroidogenic dysfunction is associated with increased ghre-lin expression in human testes . Recently, ghrelin has been suggested to be an endogenous antioxidant that functions as a free radical scavenger . Ghrelin inhibits apoptosis by increasing the Bcl-2/Bax ratio, preventing release of cyto-chrome c, inhibiting ROS generation, stabilizing mitochondrial transmembrane potential, and inhibiting the activation of caspase 3 . Moreover, ghrelin was able to promote antioxidant enzyme activity (particularly that of GPx) and reduce lipid peroxidation in the testis. Taken together with the finding that luteinizing hormone/human choriogonadotropic hormone (LH/hCG) induces an enzymatic system with known antioxidant properties in Leydig cells , it can be said that the tes-ticular antioxidant system is also regulated by hormonal stimulation.